This compact heater fits under the sink and installs easily. Powerstream is ideal for sinks remote from or independent of a main source of hot water. In new construction, run only a cold water pipe to that remote sink. You reduce heat loss and save on plumbing. Mounts in any direction and can be mounted almost anywhere. Needs no Temperature Relief Valve (see local codes). Because Powerstream is independent of a main hot water source, it can be installed in hard to reach locations. 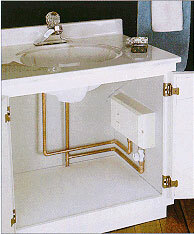 Powerstream uses a solid copper heat exchanger to instantly heat water. A durable plastic housing protects the interior components. 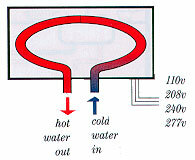 Powerstream is designed to produce low volumes of warm or hot water endlessly. 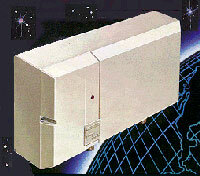 Powerstream comes in six models to serve a wide range of applications. Finding the right model depends upon your desired flow rate and temperature. Use the charts on this page to find the model best suited to your needs. Electric Instantaneous Water Heater shall be Powerstream Model___. Water Heater shall have an adjustable heat setting selector. Heater shall be ___ volts at ___ kilowatts. 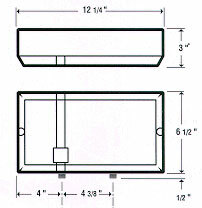 Heater shall be constructed of two copper immersion heating elements with a solid copper heat exchanger, all contained within a UL approved ABS plastic housing. IN-LINE FLOW CONTROLS AND FAUCET AERATORS SHOULD BE USED WITH ALL MODELS FOR OPTIMUM PERFORMANCE. Redring Electric through its U.S. distributor Controlled Energy Corp., (hereinafter CEC) guarantees this water heater to the Owner (hereinafter "Owner") of the water heater at the original installation location against defects in material and workmanship for the periods specified below. 1. 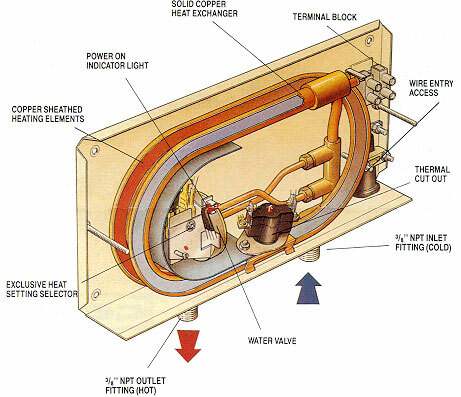 The Heat Exchanger/ Element - If the original heat exchanger leaks or the heating element fails within five (5) years from the date of original installation of the water heater, because of a defect in material or workmanship, CEC will furnish to such Owner a new heater of the then prevailing comparable model. 2. Any Component Part Other than The Heat Exchanger/Element - If any other component part (other than the heat exchanger/element) proves to be defective in material or workmanship within one (1) year from the date of original installation of the water heater, CEC will furnish the Owner with a replacement of the defective part(s). 3. Verification of Date of Original Installation - When Owner cannot verify or document the original date of installation, the warranty period begins on the date of manufacture marked on the tag affixed to water heater.